While some things are often described as having a “timeless” quality, it is more often than not that the description only holds weight for so long. Trends have a shelf life and there are few items/looks that can escape that fate. With the change being inevitable, it’s time to remodel. This can easily become an overwhelming process, especially from a financial standpoint. We’re going to go through a few ways that you can save money when you decide those trends have worn their welcome. If you plan to have a contractor participate in portions of your remodel, take the time to see which areas you can properly prepare, such as demolition work, to eliminate that from the contractor’s tasks. Now, we stress properly because poor prep work can often lead to increased project time as the contractor may have to go back, fix your prep work and then go about it the correct way. Sometimes repairs are needed before prep work can take place. Be sure to do your research on the amount of time and costs the repairs will need as it may be cheaper to replace with new materials. Offering to help with the cleanup is never a bad move. The contractor will probably take you up on that offer as it allows them to leave that much sooner. The more pieces of the project that you can take care of yourself, the more you’ll save. You may even come away with a sense of accomplishment! This goes hand in hand with preparation, the more you can plan ahead, the more you increase your potential to save. This not only goes for the materials you’ll want to use, but to foresee any hiccups that could come up along the way. This stage is also where you need to think about your future with the home. 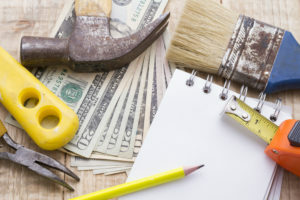 Will you be staying long term or is this remodel a means to increase your home’s value should you ever put it on the market. If you’re staying long term, you can style it to your liking and functionality needs. However, should you plan to sell it, it’s best to adhere to research what homeowners are looking for today and what they will likely be looking for in the future. This will still allow you to incorporate personal touches that can be easily adjust by the next owner, such as paint and small fixtures. Now that you have your plans finalized as much as possible, and have done the amount of proper prep work that you are comfortable with doing, it’s time to hire a contractor to take it from there. We would be more than happy to assist with the installation of doors, windows, cabinets, closets and more. We could certainly provide some ideas on custom millwork that would make an incredible addition to your rooms. We have all of the tools and experience you would want in a contractor so give us a call to talk about our services and let’s get started! This entry was posted in Bathroom, Cabinets, Closets, Countertops, Custom Cabinetry, Custom Mantels, Decking, DIY, Doors, Kitchen, Kitchen Cabinets, Millwork, Remodeling, Stairways, Storage, Trim/Moulding, Windows and tagged Bathroom remodel, custom cabinetry, home remodeling, Kitchen Remodel, remodeling. Bookmark the permalink. ← It’s Time for a Shed!